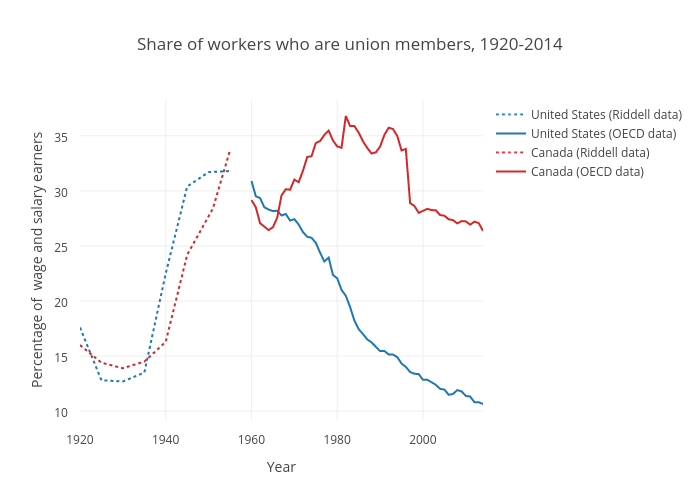 Source: OECD (for crossnational comparisons, 1960-2014); Union Source Book and Labour Canada (1920-1955), as cited in W. Craig Riddell, “Unionization in Canada and the United States,” in Small Differences That Matter: Labor Markets and Income Maintenance in Canada and the United States, ed. David Card and Richard B. Freeman (Chicago, IL: University of Chicago Press, 1993). Note: Click on the chart for the data and an interactive display.